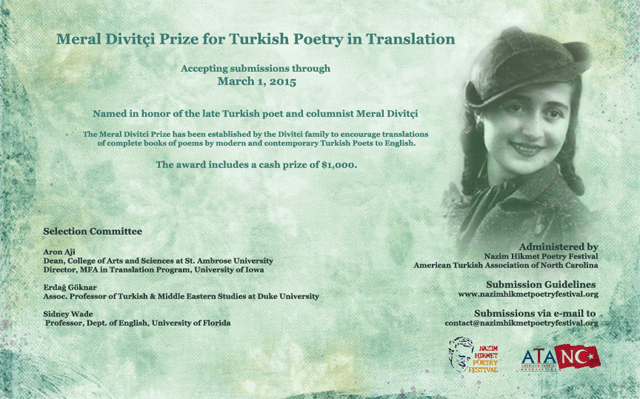 This award is named in honor of the late Turkish poet and columnist Meral Divitçi and it has been established by her family with the objective of encouraging translation of modern and contemporary Turkish poetry into English. The submitted manuscript should correspond to a complete book of poems or a collection of poems, published by established Turkish poets and should include about 50 or more pages of poems. The award includes a cash prize of $1,000. For more information please visit the festival web site. For the 2015 prize, manuscript submissions are being accepted through March 1, 2015 via e-mail to contact@nazimhikmetpoetryfestival.org.